GoGoCycles invites sellers to advertise their used motorcycle trailers for sale in our classifieds to give our visitors who want to buy an opportunity to save money. There are all kinds of trailers on the market. That’s probably because many bikers are just as particular about how they go about towing their motorcycles are they are about the bikes themselves.. I would rather ride my motorcycle rather than go touring around in a car or truck towing my motorcycle behind me. However, when I am hauling a bike that I just spent a lot of time painting and hundreds of dollars painting not to mention the cost of supplies getting it in prize winning condition, I want my bike in an enclosed motorcycle trailer with a padded interior if I can find one. 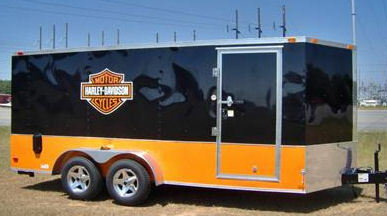 SELL YOUR USED MOTORCYCLE TRAILERS! LIST IT FOR SALE FREE! There have been times when I see guys pull up to the loading and unloading area at shows with their motorcycles riding on a flatbed trailer with a tarp belted in place and I cringe. All it takes to totally ruin their chances is a bad rock peck. Why would anybody pour thousands in customizing a fabulous bike and hold out on shopping the classifieds for trailers to protect their investment? Some people prefer to build their own towing trailers. I’ve seen homemade touring trailers that were custom made to haul show bikes from rally to rally that probably weighed a ton, but they were sights to behold. The enclosed trailers were upholstered inside and had custom paint on the exterior and probably cost more than my house to build. A luxurious motorcycle touring trailer is nice, but you can buy a used motorcycle trailer made out of aluminum that will do what it’s supposed to for very cheap prices. Especially if you pick up a used trailer for sale right here on Strike Lightning where bikers buy from other bikers and never pay a commission on the sale.